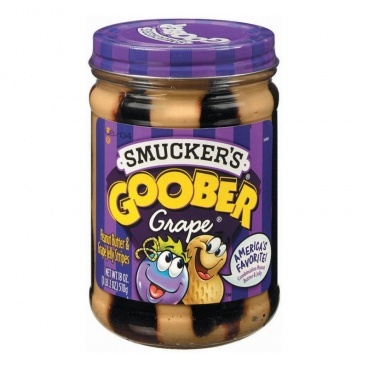 Smuckers Goober Grape Jelly & peanut Butter 18oz 510g. Only the Americans could combine Peanut Butter with Jelly, DELICIOUS. Smucker's has been producing Goober Peanut Butter and Jelly Stripes since 1968. The jar just cries out EAT ME. The best of Smuckers all in one jar. Goober combines wholesome fresh-roasted peanuts and Smucker's Concord Grape to create peanut butter and jelly perfection. 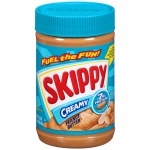 American Peanut Butter at its best. Ground Roasted Peanuts, Grape Juice, High Fructose *Corn Syrup, *Corn Syrup, Dextrose, Vegetable Monoglycerides (from Palm)Pectin, Salt, Citric Acid, Potassium Sorbate (Preservative)Sodium Citrate. *Produced from genetically modified maize. **May have an adverse effect on activity & attention in children.